So after the highly entertaining Road Warrior, there is Beyond Thunderdome. I know this one also has a lot of love, and it was a good watch but the movie itself is truly uneven. The pacing is all over the show, the plot is flimsy and confusing, and so much is happening but doesn’t really flow as nicely as you would hope for it. However, Mel Gibson is back with some truly awful hair (crushes me, you all know how I love long hair) – at least they rectify that later – and he steps back into the boots of Max Rockatansky and he is good. Anyway, having the word “Thunderdome” in the title would naturally have you think that it was more important than it actually was in the movie at the end of the day. There was some weird bungee cord fight cage that Max and some big bloke called Blaster attacked each other in, and Tina Turner belting it from a small opening in the cage about making the law and all. Then somehow it jumps from there to a bunch of feral looking people out in the apocalyptic desert, waiting for a pilot to fly them away. I know, right, it all flows wonderfully. It’s as if it is two different films that have been meshed together. I really liked the first half, and I liked the end of it again, Max doing his thing and slipping away quietly, but the middle section was a bit sketch. Anyhow, the effects were alright, there was some cool car chasing going down again and some cheesy dialogue, and then there was the awful scene with Gibson hitting this one woman who wanted to leave (people, this should have been a warning of the upcoming crazy that was to be unleashed) and it was still a fun watch. This movie is nothing like the two before it, yet still holds its own as an entry to the Mad Max canon, messy as it may be. This entry was posted in Movies and tagged Beyond Thunderdome, George Miller, Mad Max, Mel Gibson, movie reviews, movies, really strange, Tina Turner. Bookmark the permalink. So I’ve got both of these films still on my immediate To Watch list. Your review is definitely in sync with a lot of people’s; it’s a weird, inconsistent bit of entertainment that’s maybe slightly better than the original but not as good as the second movie. I’m still pumped to catch up on all this. But I’m prepared for it to be. . . odd.. . . and I’m prepared for Mel Gibson’s crazy hair. I cannot believe that I missed this comment! Yeah, the second one certainly reigns supreme in the original trilogy, but the newest movie is just… what all of these wish they were! I finally got to see them over this summer and enjoyed them quite a bit. I actually think I liked them all more than Fury Road. Fury Road is so much more modern and not always for the best. But that’s just me. Good review Zoe as always, you deliver great work consistently. I liked this one but it just wasn’t anywhere near as good as Road Warrior. I REALLy like this one, Giuseppe. My favorite until Fury Road came out. I know you did, it just didn’t work for me like I was hoping. When I was younger, this was all fun and games. Now? Uneven 😦 Fury Road was AMAZING. 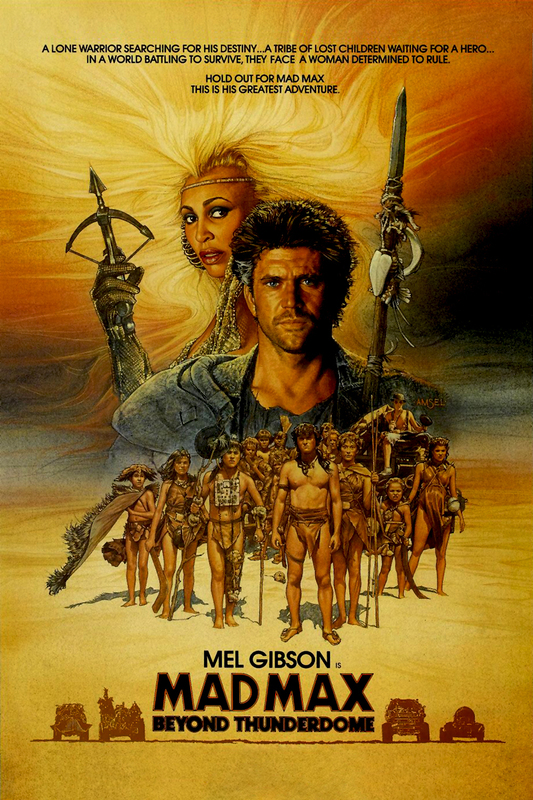 I’ve got fond memories of Mad Max Beyond Thunderdome, and even though it’s oft-maligned a lot of it is actually amazing: Bartertown, Master Blaster, Aunty and “Two men enter, one man leaves!” are all crucial entries in the Mad Max canon. The sets, vehicle and costume design aren’t too shabby either. I only wish Mel Gibson could have reprised the role one more time and brought the story full circle. Yeah, not a bad movie, just a little uneven. I loved the whole concept of Bartertown and Thunderdome and all, but that was run through so quickly. Gibson was fantastic in the Mad Max canon for sure, but I have to say that Hardy impressed me quite a bit in the new one.